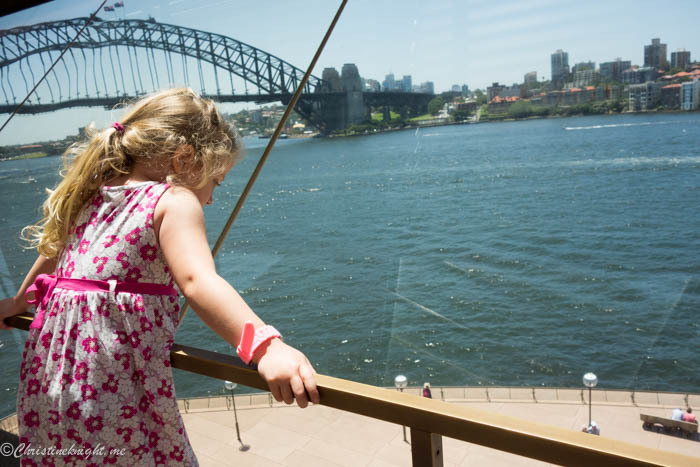 The Best of Sydney for Kids: The Sydney Opera House Day Pack - Adventure, baby! Since we moved back to Sydney, I’ve taken enormous pleasure in rediscovering my hometown with a child. I grew up in Sydney’s south-west, where most of my childhood was spent riding my pony, or biking around the streets with my brother. 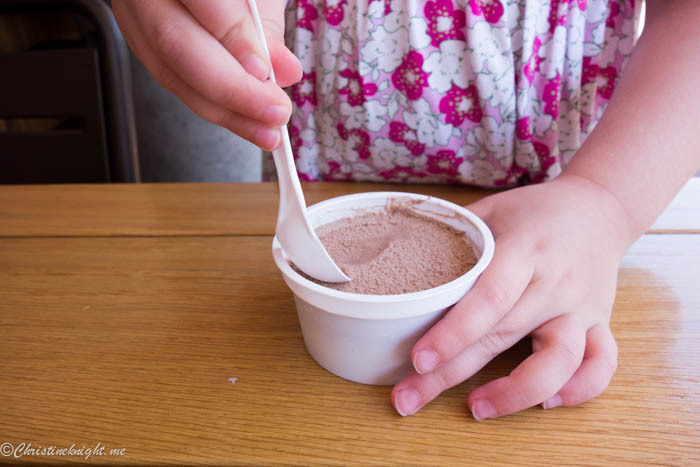 A far cry from the way we spend time with Cheese as an inner city kid! We’ve been to the Sydney Opera House to see shows on many occasions. They are always of a high quality, and are a highlight of our year. 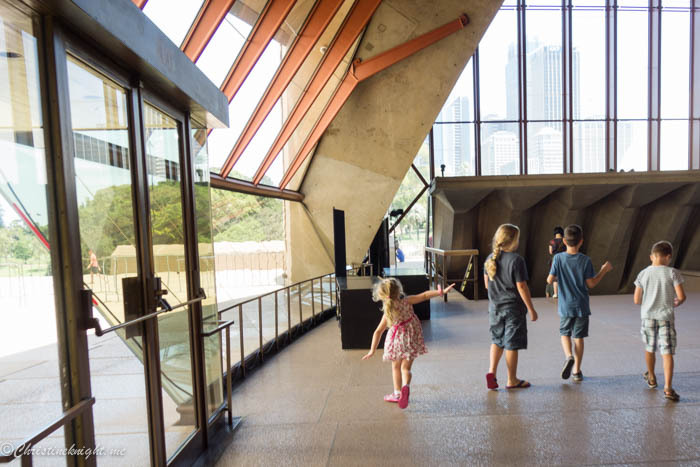 We even attended the Sydney Opera House open day a few months back, where the House was open to the public. While it was interesting seeing the House behind the scenes, it was very crowded, and we left pretty quickly as Cheese wasn’t enjoying it. 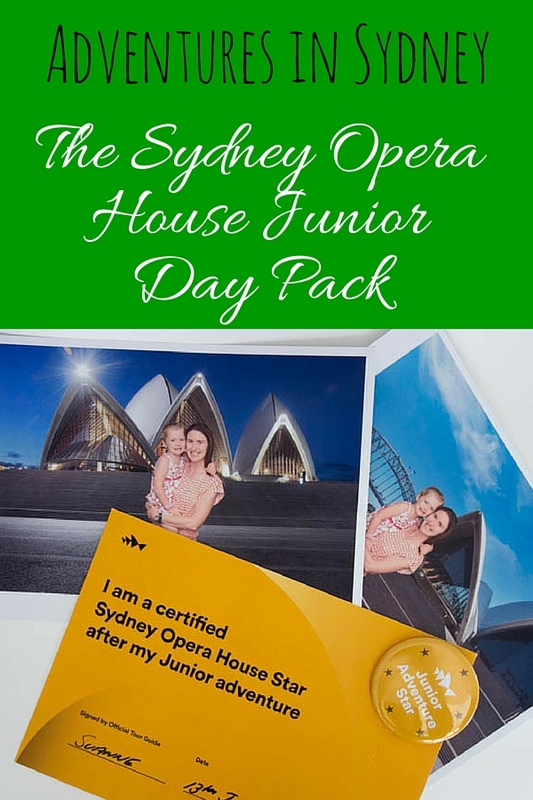 So I was thrilled to discovered that the House has this amazing offering called their Day Pack at the moment, which offers families a Junior Lunch at Opera Kitchen, a special behind the scenes tour of the House on the Junior Adventure, finishing up with a show. Each Day Pack has a different itinerary, depending which one you choose. They all meet in the same spot, at the Welcome Centre at the Sydney Opera House. You can find this by taking the escalators down from the boardwalk, then walking past the Opera House Bar and Kitchen until you get to the souvenir shop. Look for a sign here, where your guide for the day will be waiting for you. Our amazing guide was a vibrant, energetic woman named Suanne. She was made to work with children, without a doubt. My daughter loved Suanne. I loved Suanne! Cheese was the youngest on the tour (the average age was about 8), but Suanne managed to keep the interest of all the kids, from little Cheese to the oldest, who were tweenagers, and even earned herself a hug or two along the way. Our first stop on our big adventure was lunch at Opera Kitchen. 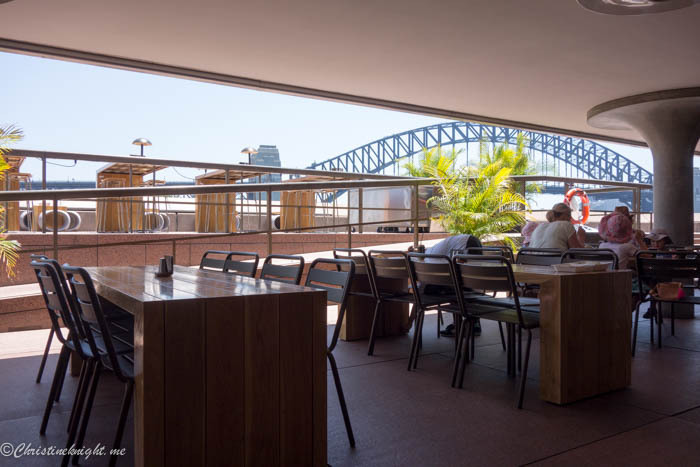 We had a fantastic seat overlooking the Sydney harbour, with the Sydney Harbour Bridge in the background. I mean, seriously?! I can’t even describe the beauty of our city on days like this, it’s just too much. 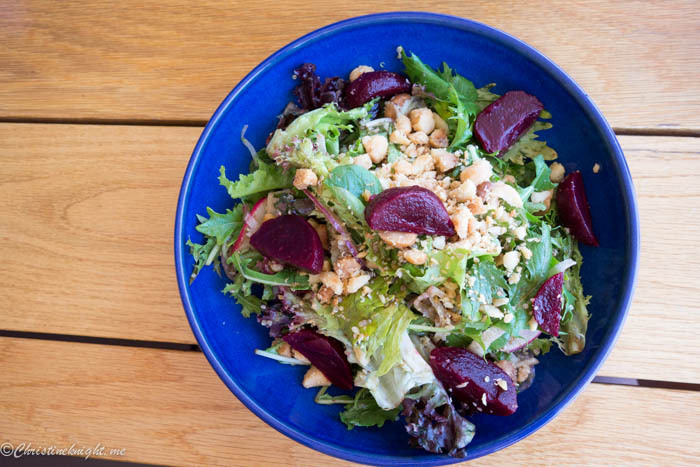 We chose the Quinoa, Beetroot, Feta & Macadamia Salad (served with your choice of house beer, wine or soft drink) for me, and the Junior Fish & Chips (served with a small soft drink or juice and ice cream) for Cheese. 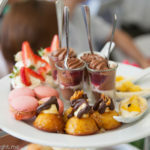 I appreciated that the food was served quickly for a busy day. 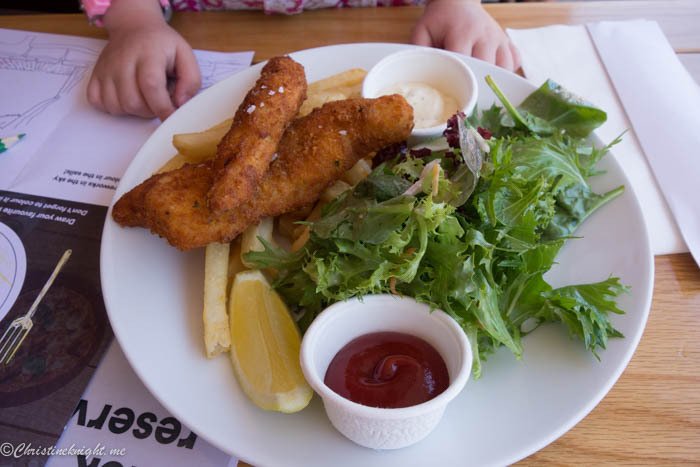 Cheese loved her fish – it was lightly crumbed, nice and hot, and not oily at all. She had two dipping sauces and a lemon wedge to dress her meal with, much to her delight. My salad was enormous, but since it had a lot of lettuce in it, it ended up being the perfect sized portion for lunch, and not too heavy for someone who was about to to a lot of walking afterwards. After lunch we grouped together, ready for what I was most excited for – the tour. 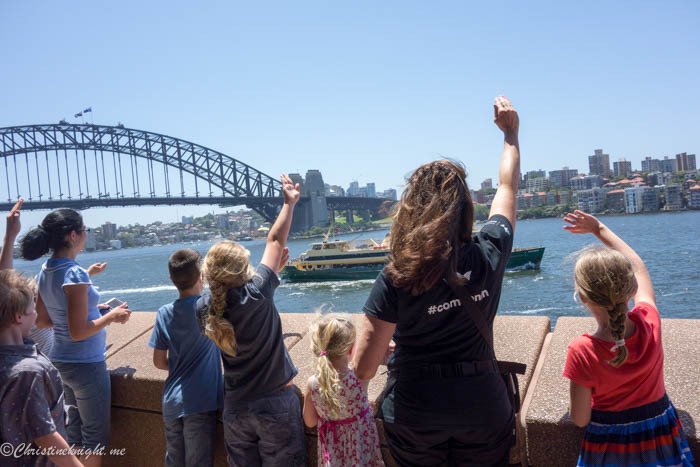 Suanne made it very clear that the tour was for the kids, not the adults, and had the kids all put their hands in and give our a big cheer “Kids!!”. 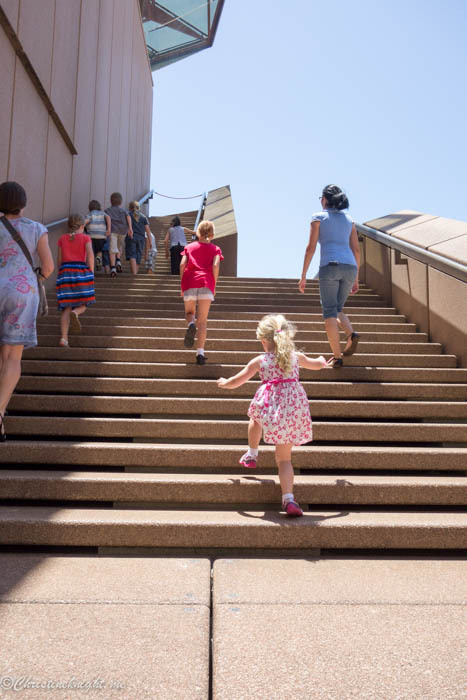 As their voices vibrated around the concourse, the air filled with excited giggles as the kids loosened up, and thus, the tone was set for our tour. Lots of fun, plenty of laughs, and an extremely energetic look at one of the world’s most iconic buildings. Our leader Suanne led the kids up the stairs, with us adults struggling to keep up in the rear. 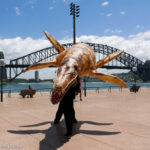 Up on the boardwalk, we learned the first of many amazing facts that we would absorb that day – all of which were embarrassingly new to this Sydney native. The Sydney Opera House was designed by Jørn Utzon, a Danish architect, after winning a contest in 1957. I only remember the name thanks to Suanne’s entertaining pronunciation for the kids: “Yaaaaw Boots on”. Very effective. 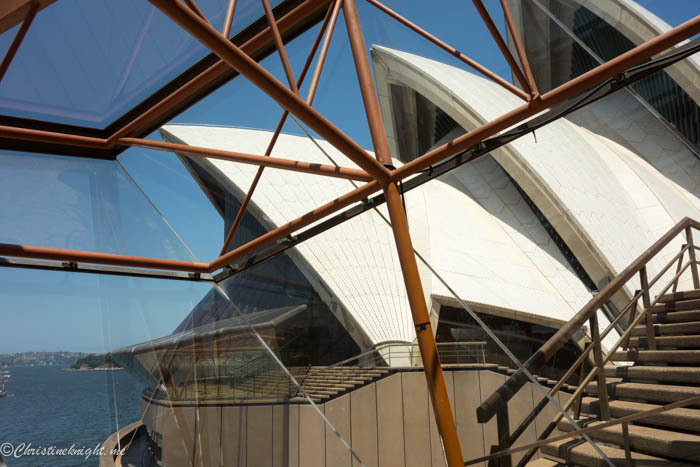 While the Sydney Opera House is only 58 years old, the land it is built on, Bennalong Point, has previously been a meeting point for the Gadigal tribe. After paying tribute to the indigenous people whose land we were walking on, we took our first steps into the House, and, after a little actors warm up to get the kids ready to perform, walked into the Studio (sadly no photos allowed today!). Cheese and I had seen many Babies Proms inside the Studio, but on our tour it was set up for the current show, Blanc de Blanc. While the kids took turns presenting the show to their rapt parents, we also learned that the Opera House was built in such a way that scenery has to be lifted up and down, it can’t be moved in from sides. Because of this unusual design, the Studio was built to be a lift for scenery. 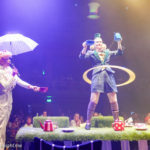 Nowadays, however, it is a flexible performance space. Next on our tour, was another of the 800 rooms inside the Opera House – the backstage area where props are stored. We saw parts of the three opera sets that are housed in the room, including the Magic Flute, and the giant hydraulic lift that takes the props up to the stage. Suanne paid tribute to the many people who work at the House to create the performances we see, including prop builders and the people who handle the intelligent lights that cost 65K each (geez, wouldn’t want to be anywhere near one of those!). We wound our way into the next room on the tour, the rehearsal room, where the casts and musicians practice. 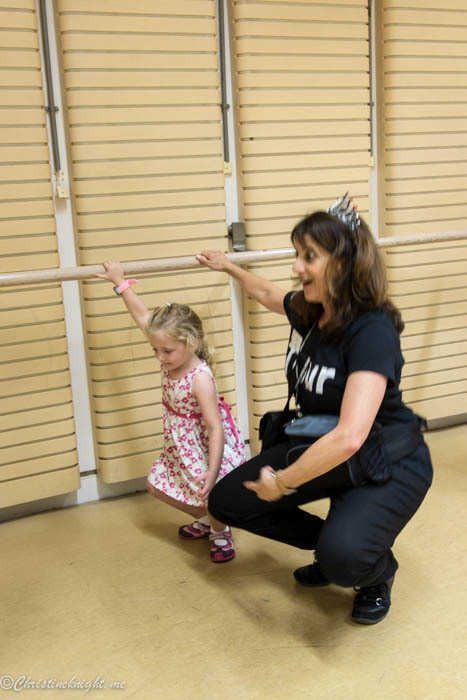 I couldn’t help but place my hand on the barre too, thinking of all of the amazing ballet dancers who had stood in that very spot, warming up with plies and tendus. 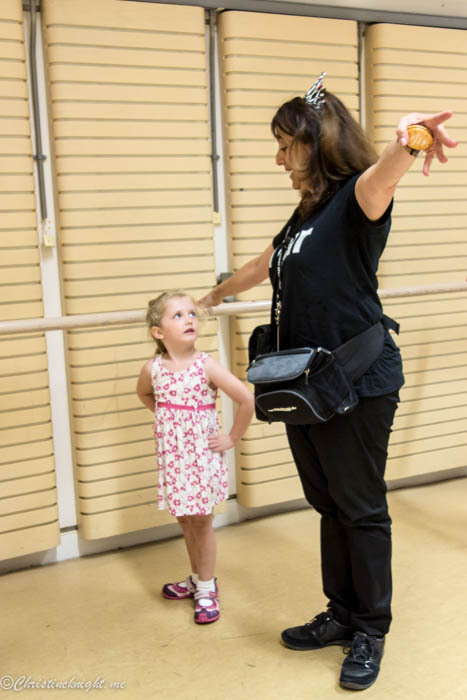 The kids all had a turn practicing their moves, including Cheese, who was working on her arabesque. The tour stepped outside next, through a sneaky exit, where we walked up some more steps (note, do not do this tour if you don’t like steps!) 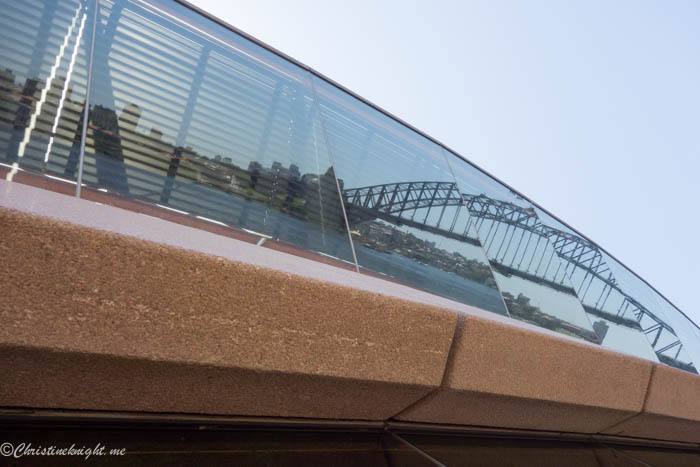 to admire the amazing view, as well as see the reflection in the glass of the Sydney Harbour Bridge, if you look up at just the right angle. What an incredible design. If you’ve ever wondered why the million tiles of the House always look so clean, and yet you never see anyone actually cleaning them, it’s because they are especially made to be self-cleaning with a special glaze on them. We waved like royalty to passers by, then ducked back inside another sneaky door to a little amphitheatre filled with costumes once worn by performers at the House. 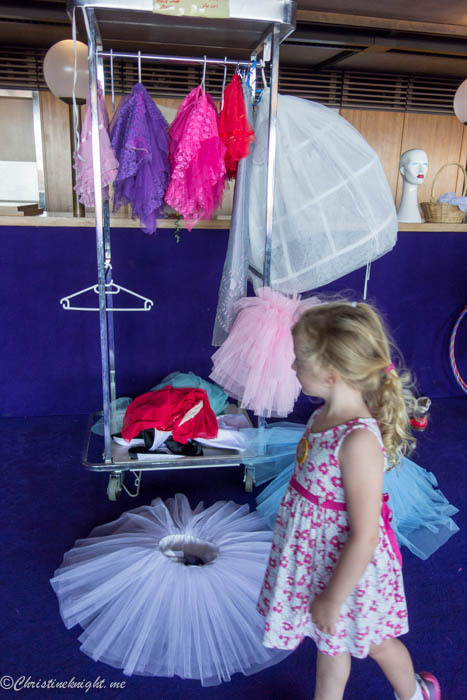 The kids had an amazing time trying them on, taking a bow, and learning about props. 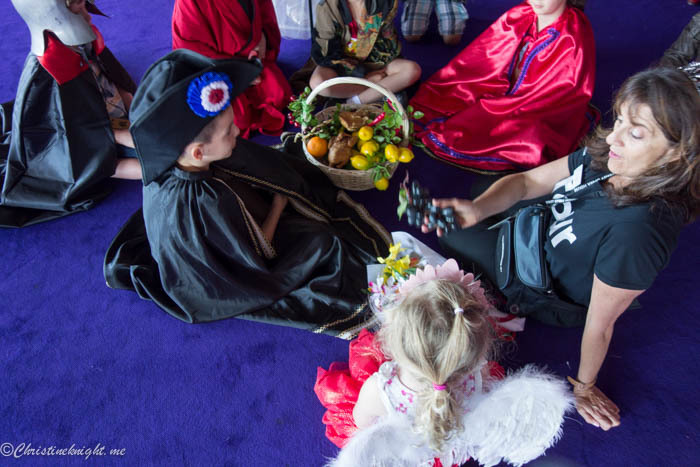 As the kids answered questions and participated in the activities, they were awarded with a cute star badge, which they all wore with pride. The last stop on our tour was the spectacular Concert Hall (sadly no pictures allowed since staff were performing sound checks), home of the symphony orchestra. 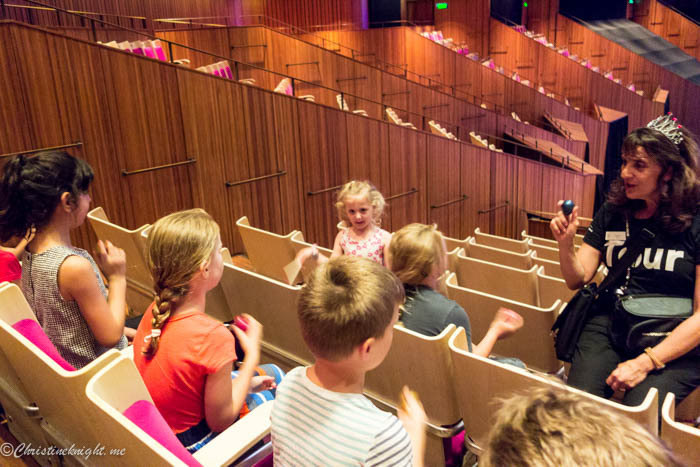 We sat in some of the 2679 seats and watched the kids try their hand at being their own orchestra so we could hear the noise vibrating around the beautiful white birch wood ceiling. I’d never noticed before that the hall was shaped to mimic a guitar, with its high vaulted ceiling and brush box panelling. If you’re interested in hiring the hall for a private gig, it will set you back a mere $18K. 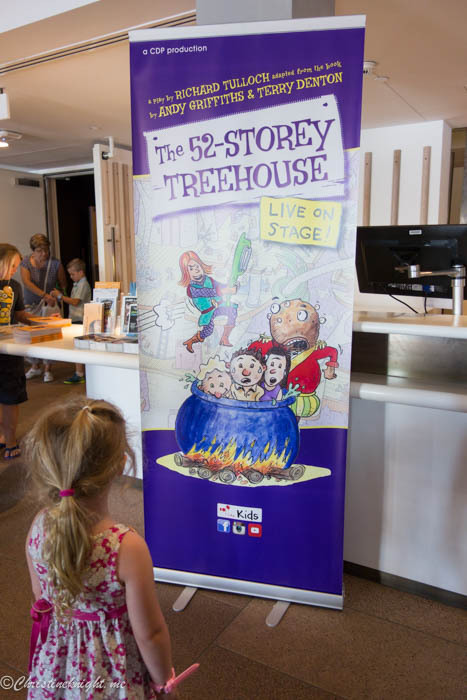 After the tour ended (it ran for 60 minutes), Suanne took us to the Playhouse, where we were about to see our show: The 52-Story Treehouse. We arrived just in time to look at our souvenir photos (two are included with the package, with extra costs if you’d like to purchase add-ons) and take our seats. You can read more about how much we enjoyed The 52-Story Treehouse here. 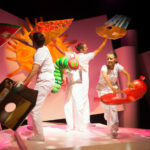 After the show, we had some time to enjoy the Creative Play station in the Playhouse that is open until the end of January. 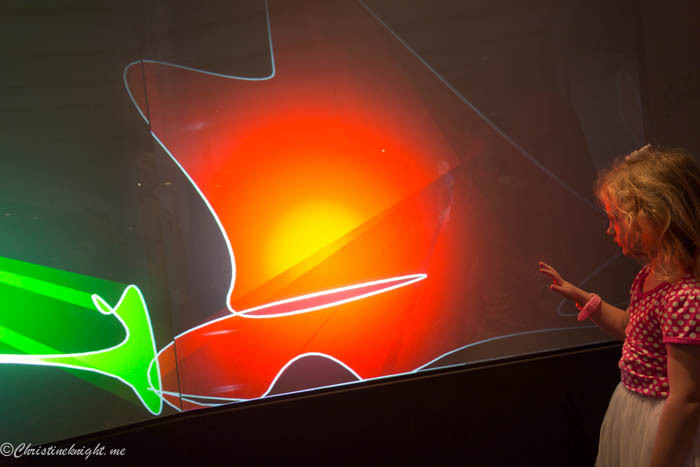 The current installation is “The Un-Broken Line”, which is basically a massive, interactive digital screen where kids can manipulate colour and lines. It’s pretty addictive play, and really hard to tear the kids away from. 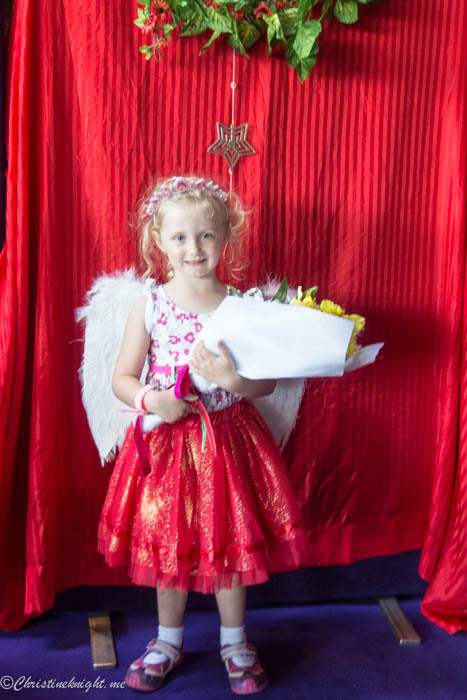 With Sydney summer giving us both big storms and brutal heat, it’s wonderful to have an indoor space catering to kids for us to enjoy. 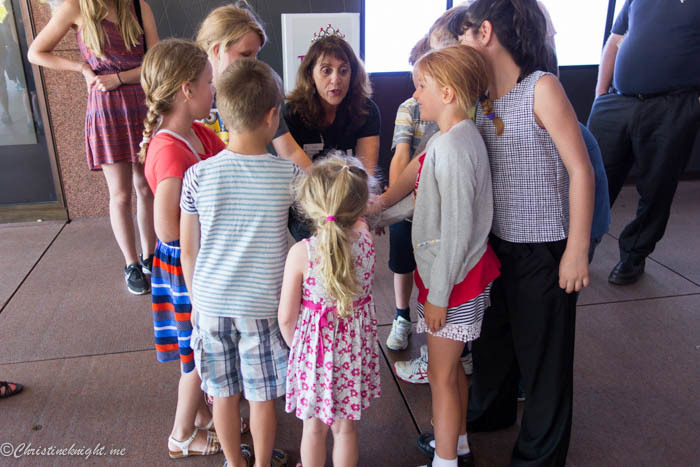 You can read more about the free Summer entertainment for families at the House here. 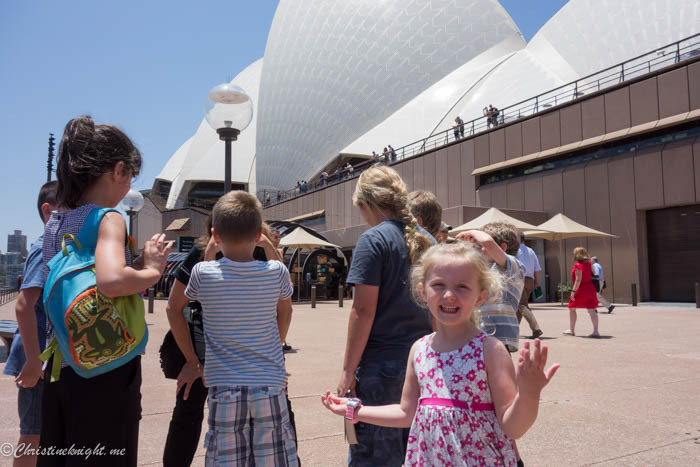 I can’t recommend the Sydney Opera House Day Pack enough, both for tourists and Sydney locals. 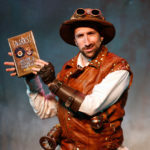 I guarantee that not only will you and the kids have a fantastic time, but you will all learn some amazing facts about one of the most interesting buildings in the world at the same time. 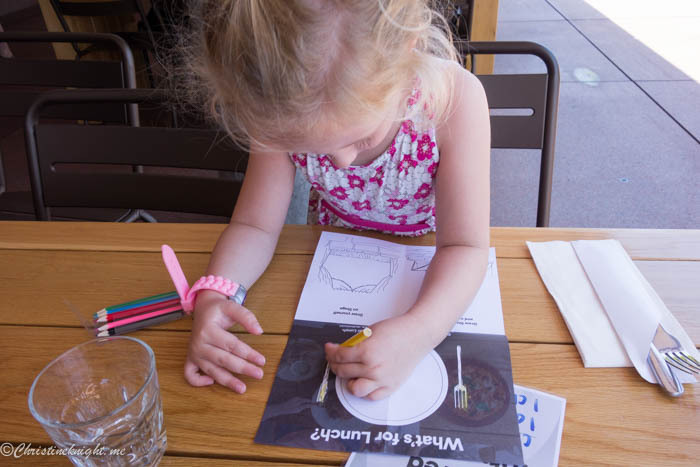 A delicious Junior Lunch and drink at one of our harbourside, family friendly restaurants. Check online to get accurate pricing for the Day Packs. 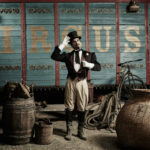 As different shows are included in the pack, pricing may change. Car – park in the onsite Opera House car park. 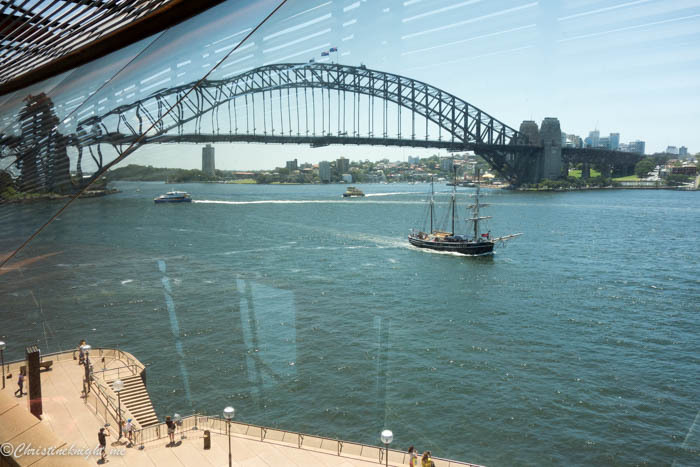 For discounted parking, book online with Wilson car parks and check the Sydney Opera House website for any current promo codes. 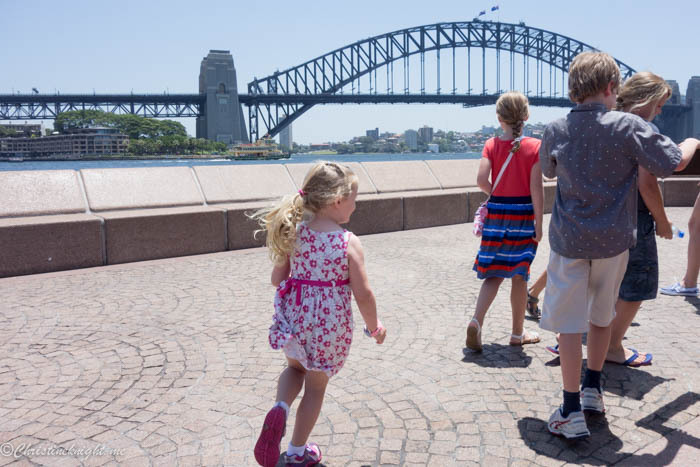 Buses, trains and ferries – all service nearby Circular Quay which is an easy 5-10 min walk to the Opera House. A huge thank you to the Sydney Opera House for hosting us on this fantastic day. All opinions are my own.